He called the second stage the Zone of Proximal Development (ZPD) which had, as said, two limits: the lower limit, which was set by the maximum level of independent performance, and the upper limit, the maximum level of additional responsibility the student can accept with the assistance of an able instructor. But Vygotsky believed that learning shouldnâ€™t follow development, but rather should lead it. A student should constantly be reaching slightly beyond their capabilities rather than working within them (Jo Turner-Attwell, 2009). The role of a Personal Learning Environment may be not only that of a tool to provide access to â€˜More Knowledgeable Othersâ€™ but as part of a system to allow learners to link learning to performance in practice, though work processes. And taking a wider view of artefacts as including information or knowledge accessed through a PLE, reflection on action or performance may in turn generate new artefacts for others to use within a ZPD (Graham Attwell, 2010). There is a sort of corollary to the previous second statement. In Vygotsky’s time, learning — and hence the ZPD — was sort of linear: woodcarving apprentices would move “up” to a new master craftsman once they had mastered some skills themselves with the help of their previous/actual master. Progress would end when there were no more master craftsmen around whom to learn from. On the other hand, learning face to face with a human more knowledgeable other meant not only that one had to â€œuse them upâ€ but that one could not â€œconsumeâ€ any other more knowledgeable others: learning was unidirectional, linear. PeÃ±a-LÃ³pez, I. (2013). Heavy switchers in translearning: From formal teaching to ubiquitous learning . In On the Horizon , 21 (2). Lincoln: NCB University Press. Peña-López, I. 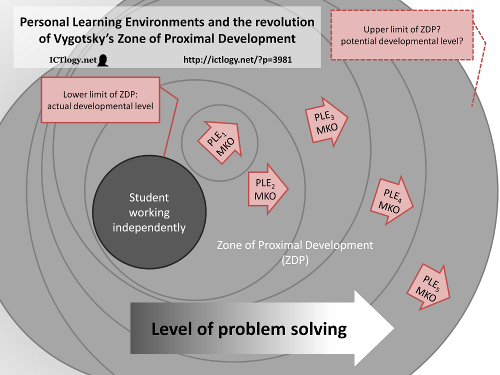 (2012) “Personal Learning Environments and the revolution of Vygotskyâ€™s Zone of Proximal Development” In ICTlogy, #107, August 2012. Barcelona: ICTlogy. PeÃ±a-LÃ³pez- that is fantastic explanation of Vygotsky theory and tying with elearning makes it indeed a powerful theory.The implication of Vygotsky theory in instructional design is clear- most of the things up to the lower limit of Zone of proximal development can be delivered to the students. However, above upper limit of the ZPD more intractive content may assist the learner. On the third stage and line with the connectivism theory the MOOC would hand it. Actually, I am attempting to reconcile EngestrÃ¶m’s “activity theory” and his later (2011) critique of Design Research theory in favour of Vygotsky’s “double stimulation” and his take on “formative interventions”; with your proposed model. Thank you very much for van MerriÃ«nboer & Kester’s reference. I neither knew the chapter nor the handbook.